Supermarket giant Asda has banned teenagers from buying eggs, traditionally used as "trick or treat" missiles, in the run-up to Halloween. The store says it has warned staff to be extra vigilant in spotting youths buying eggs. It says the decision was taken following reports of egg-related vandalism last Halloween. Other big name supermarkets have not implemented a ban, although Sainsbury's says it has a "common sense policy". 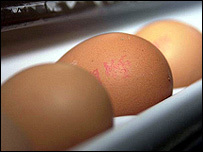 We've said that we're going to be more vigilant and we're not going to be selling eggs to under-16s. An Asda spokeswoman told BBC News Online the store was trying to help "nip the problem in the bud". "We've said that we're going to be more vigilant and we're not going to be selling eggs to under-16s"
But it was not a blanket ban, she said. "Our staff will use their discretion. "If a 15-year-old goes into one of our stores and buys a pint of milk, a loaf of bread and a packet of eggs then that seems normal." A spokesman for Tesco said the company was operating a "common sense policy" where members of staff could refuse to sell eggs to groups of teenagers. Each year, police forces across the UK are inundated with complaints over anti-social "trick or treat" incidents in the run-up to Halloween. In June, a teenager nicknamed "The Egg Man" was banned from throwing eggs under an anti-social behaviour order (Asbo).